Systems Connection is passionate about the environment, and dedicated to Greening Initiatives. We recognized early on that new and used furniture generates tons of cardboard, metal and other sustainable materials. We want to do everything we can to help maintain a better planet for employees, customers and future generations. 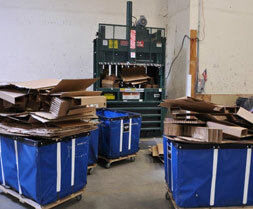 We recycle all metal wood and cardboard that comes through our warehouses, and picked up from our jobsites. Systems Connection has cardboard bailers on premises to bundle cardboard for delivery to recycling facilities. Furniture pallets that come through our warehouse are re-used, re-built, re-purposed, or re-cycled when beyond repair. Systems Connection has developed electronic administrative and customer notification processes to minimize the use and waste of paper and energy. We have established accounts with fleet service vendors to minimize our carbon footprint on the environment.